Digital game forms are increasingly used in educational contexts, and the potential of digital games to create significant learning impact is a huge growth area internationally. This project seeks to broker relationships in building game-driven learning tools to support math curricula in a network of interest across academic and private sector partners. As an approach for design research the design and development of games is recognized as offering a constructionist approach to creating new models for learning. The objectives of this project are to formalize an existing relationship into a more closely framed collaboration and grant submission between project partners. The Math Games Project supports the start of an ongoing and larger research project. In interdisciplinary design teams, the students from OCAD U’s Game Design class were presented with the challenge of conceiving and developing a complete growth plan for virtual math games. The games would be built for mobile consoles (iPhone, Java-based phones) and for young students. The games considered the growing presence of technology in the educational environment and the potential to foster young students’ positive reception of math. Project partners have committed resources in kind to this project e.g. JumpMath to provide subject expertise, content and context and pedagogic and cognitive expertise coming from The Hospital for Sick Kids (see below). Collaborate with University of Waterloo in researching user interaction with various game platforms, game play, and/or theming. Engage broader base of partners in detailed scoping exercise. Prototypes developed will be introduced to various elementary school classes. Foster a working relationship with industry partners. Feedback from the classes will be tracked by the Human Factors researchers at University of Waterloo. 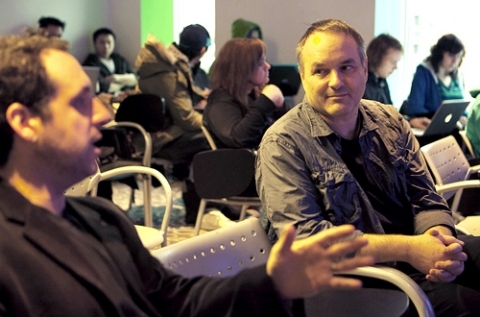 Engage existing OCAD students in design process. This funding will help the OCAD team collaborate and contribute to an interactive math pedagogy research initiative being developed with JumpMath (John Mighton). This initiative seeks to find ways of creating engaging courses for students struggling with math in elementary school, high school and college as well as users outside of an educational context who wish to improve math skills. It involves a two-pronged approach that will translate existing curriculum, exercises, and workbooks developed by JumpMath as well as create new game modules that further a student's math learning outside of class time. The project received early funding from the Corus Seed Grant, and will seek for continued funding from a variety of sources including SSHRC, NSERC and OCE.